I don't know about you but, for me, it isn't that easy to imagine when the time will come for me to drive a Lamborghini Aventador, let alone owning one example of one of the world's finest supercars. However, of course, there're people luckier than me that they get to drive such a hyper-powered car within every single day. Only thing is, some of them are probably just not careful enough, like this Thai driver here. 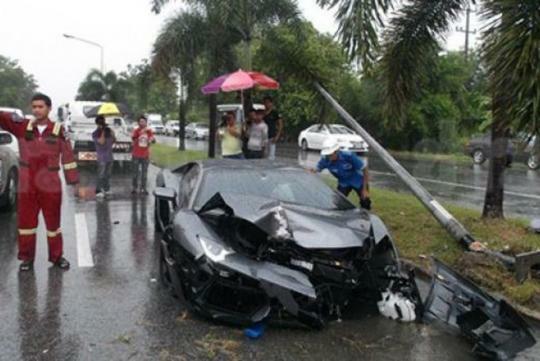 Mr. Somkiat Kruwongpaiboon, a 45-year old local businessman, told the police that one of his car tyres blew up as he was heading to his father's funeral ceremony, causing his proud supercar to spin. As a result, the unfortunate Aventador had to 'kiss' (by that, I mean crash into) a number of electric poles as well as trees with its front fascia before it finally came to a halt. Yes, you guessed it right, there's no way that the car wouldn't suffer from a heavy damage after such an incident. However, it was a relief that the Thai businessman survived and only suffered from negligible injuries. According to him, the fact that he survived despite the severe damage to his Italian supercar was all thanks to the amulet he was wearing at that time. 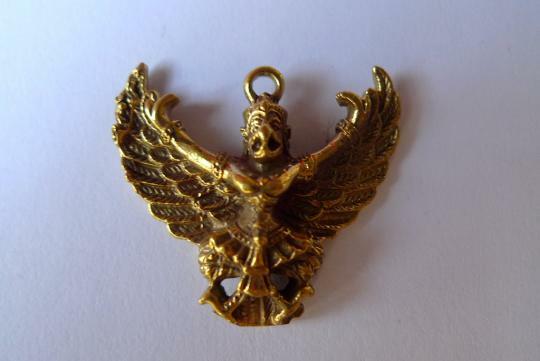 It was encrusted in diamond and in the shape of the Great Garuda (which is a God-like character from Hindustan myths). Well, it seems like there're times we need to believe in myths, too. Nevertheless, it seems that perhaps the 690bhp 6.5-litre V12 engine of the Aventador is just too much to handle. You see, that engine, along with its seven-speed single clutch transmission, can push the car from 0-100km/h in a mere 2.9 seconds. To top it off, the raging Italian bull won't stop gaining speed until it reaches at least 349km/h. Judging from the images, it seems like driving a supercar is one thing and, keeping it in one piece is a yet another. So, are you in for a ride in a supercar or would you rather play safe with the average car? Amulet saved him? Don't be silly. Based on the photo, the front suffered the most damage but the passenger/driver compartment seems intact. That is, a supercar construction is different from that of a normal saloon. How many drivers and passengers have walked away unharmed from supercar crashes? If it was a side impact, the outcome would be much different.